In tanto ecco altri video video. E vi annuncio che anche su Secondlyfe c’Ã¨ gente che segue quindi quello che si auguravano gli organizzatori sta andando per il verso giusto. Alessandro Valli con “Interacting with Things” non si poteva non parlare dell’esperienza di Surface (Microsoft) e di IO. Paolo Rigamonti con “Artigianiato Digitale & Nuovi Maker” , forse lo speech meno interessante in apparenza ma che solleva comunque interessanti riflession : molte necessitÃ tecniche non hanno soluzioni pronte sul mercato e si arriva ad autocostruirse mi fa subito pensare al monitor immersivo che ho provato ieri: quante cose mi servirebbero e dovrei farmi? il futuro Ã¨ quindi personalizzazione ai massimi livelli? Nicolas Nova con “PeopleThingsPlace: hybridization over the Internets” che tra le tante cose solleva il problema che non Ã¨ vero che digitale Ã¨ immateriale anzi richiede ingombranti infrastrutture. Stefano Sanna un sardo veramente simpatico che ha portato un piccolo riassunto della situazione attuale del web. Tecnologia web 1.0 dove l’utente Ã¨ solo recettore ed Ã¨ obiettivamente bombardato da informazioni (mobile browsing); e ora la tecnologia web 2.0 meglio conosciuta come mobile blogging, all’interno della quale l’utente Ã¨ partecipe ed interagisce con il monod. Oggi si spinge molto verso questa iterazione a cominciare da Sun con le sue SunSpot e ai mille sensori rfid. function object a electronic object per giungere a connected object. Special Guest: Takanori Shibata che direttamente dal giappone ha presentato un artefatto (Human Interactive Robot) estremamente interessante PARO un robot che reagisce/interagisce con le persone pensato appositamente come strumento terapeutico per le persone negli ospedali ma anche per la famiglia, Ã¨ come avere un vero animale per casa. Andrea Genovese fondatore di 7thfloor.it che fornisce il coverage odierno; ha presentato euromedia strumento basato su geoblog ossia legare googlemap ad un blog e contestualizzare il blog. che purtoppo non ho potuto seguire ma che recupererÃ² grazie ai video. A condimento aggiuntivo alla gian ben nutrita giornata la fine di ogni intervento era preceduto da segnali acustici che indicavano allo speaker che aveva raggiunto il limite di tempo, tecnica che credo sia estremamente intelligente in quanto : informa il pubblico, non Ã¨ fastidioso anzi piacevole e ovviamente se ne accorge anche lo speaker e non puÃ² far finta di niete. le foto sono giÃ presenti sul mio flickr. schermo immersivo (che ho provato in anteprima e che ho trovato affascinante). Che dire Ã¨ ora di andare a riposare domani ci aspetta una giornata live veramente interessante. 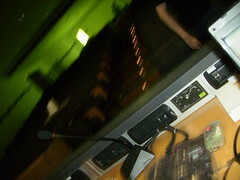 Some time ago MS did the Mix’07 conference. We didn’t publish any articles on this mostly because there is a lot of material to digest but I think we can sum the most exciting things that came out of it as DLR and Silverlight. Q1: What is your language of choice? Q2: Would you like to deliver your app to anyone through the browser? Q3: Would you like to offer some sizzling graphics? Now, if you answered Q1 with Java, you’re in luck as Java has this thing called applets and you can reach a lot of people but not too many as folks don’t like big downloads and difficult installs, you might have issues with Q3 but you could do some nice apps. If you answered Q1 with ActionScript, Flash is your tool of choice. Of course you’ve got great graphic tools, market penetration, but how big and complex can your application become, also what is the performance you can expect? Notoriously .Net already runs a bunch of languages, and it already has the capability to run applications in a browser. Has anyone seen any in all these years .Net was out in the wild? Not me. So, some people went in a room and said, let’s get some cool basic stuff out of WPF, make it really small and lean and add beside the .Net runtime the DLR, make it cross platform (initially MS ships a Windows and MacOS plugin that will run under IE, Firefox and Safari, mono has produced a Linux prototype in just 21 days) and lets call it Flash-Killer. Someone objected and they renamed it so it became Silverlight, but that is another story. Just think, you can build an application that can run in any browser, on any platform in any language. What will this bring? We still don’t know. Will we see the Web fracture having Web (2.0), Flash, Silverlight, JavaFX+applets all chasing the same goal? It’s hard to tell, on one hand these new platforms offer applications that were not possible to create before thus giving more value to the web and to the final users, but on the other it’ll fracture developers, tool sets and bring more interoperability problems. SOA’s and WS’s will finally find their ultimate cause of existing (REST and JSON as well). If I see one thing in danger of this fracture is loosing ontology’s, loosing global knowledge that can be harvested and automatically linked together on the web if we keep the web simple. Something tells me in the end both worlds will coexists and we’ll just have more and more options instead dumping one for the other. What do you see? For the moment I’ve added jspart to Ohloh, SourceKibitzer and CIA, if you use any of these instruments you can find me there. I’ve seen this video and even though as features go this doesn’t have anything in particular, I’m amazed how you can create a clone of a real device in such a short period of time. PS. E’ vero che il paintball Ã¨ vietato in Italia a differenza del airsoft? This of course had the disadvantage to be completely fixed in height, but still provided the possibility to scroll around the data in the layer. So, I decided to use Interface in order to give the div the ability to resize. As the main Interface page offered only two examples of a resizable textbox and a selection over an image I’ve decided to publish this example where I show how to do the same thing but with a div (layer). This example uses Interface 1.2 and jQuery 1.1.2. I can’t wait for Interface 2. You are currently browsing the SigmaLab blog archives for June, 2007.